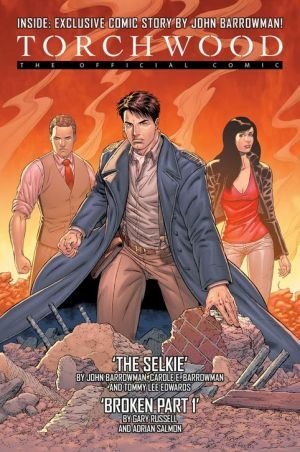 Torchwood comic debuts at Comic-Con with Tommy Lee Edward's signing! Titan Publishing is pleased to announce the launch of Torchwood comic, based on the hit BBC America show. Acclaimed artist Tommy Lee Edwards, currently working with outspoken TV personality Jonathan Ross on the hit comic series 'Turf', has teamed up with John Barrowman (Torchwood's Captain Jack) and his sister and frequent coworker Carole E. Barrowman, to produce 'Captain Jack and the Selkie'. 'Captain Jack and the Selkie' is one of two original Torchwood stories in issue #1 and sees Jack facing a deadly threat on a remote Scottish island, where people are disappearing one by one. To his horror, Jack starts to suspect he may know who, or rather what, is responsible. The second story is part one of a special five-part story written by Torchwood TV script editor Gary Russell. Entitled 'Broken', the story sees Captain Jack, Gwen and Ian to get trapped in a cosmic hotel, while an old villain from the TV series returns. Two collectible covers will be available for each issue - an art cover and a picture cover.